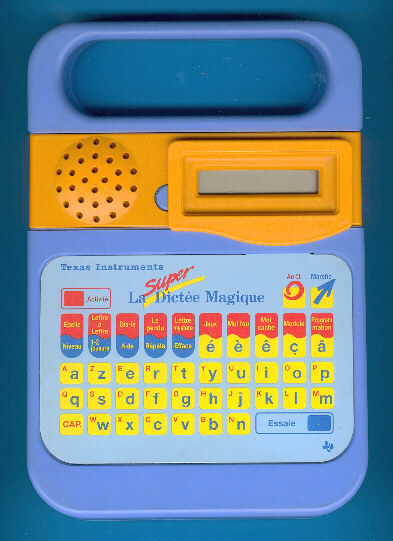 The English speaking sibbling of this French talking La Super Dictée Magique was called Super Speak & Spell, too. In Italy we know the Grillo Parlante Piu, with the El Loro Parlanchin and El Loro Profesor two Spanish versions were introduced. Anglais 1 300 Contains words in everyday use. Helps to master the spelling of a basic French vocabulary. No2 200 Advanced vocabulary to challenge children and adults. © Joerg Woerner, March 16, 2004. No reprints without written permission.